There have been a number of fresh enquiries in the last few weeks, I usually get asked the same questions, but for once I got one from fellow RetroBike enthusiast Dylan that hasn't been asked before. How does one go about going Ski-biking, please? I presume you are doing most of this in France and there is nothing doing at an indoor slope? There isn't an indoor slope in the UK that has a skibike set-up, but you can try the very similar Snowscoot model, with instruction, at ChillFactore in Manchester. You can also skibike at the sister site SnowZone in Milton Keynes, but only as an experienced rider with your own skibike. There is also a wonderful indoor slope in Germany, not that far from Calais, that I have been using off season for both fun and training. I expect to be returning there on a number of occasions in 2014. I usually go to France in winter and stick to the Western French/Swiss border, I do this mainly because I have the keys to a flat on the outskirts of Geneva to use as my base camp. There are some conveniently located hotels and B&B's in the Giffre and Arve valleys nearby and close to the most skibike friendly resorts. They are ideal for short break taster sessions and living costs at the base of the mountains are reasonable. Learning to skibike is a quick process, you should be able to get round all but the expert runs on your first day. Mastering the skibike can take a bit longer, I've been riding for about 18 weeks and still wait for the Jedi skills to arrive. 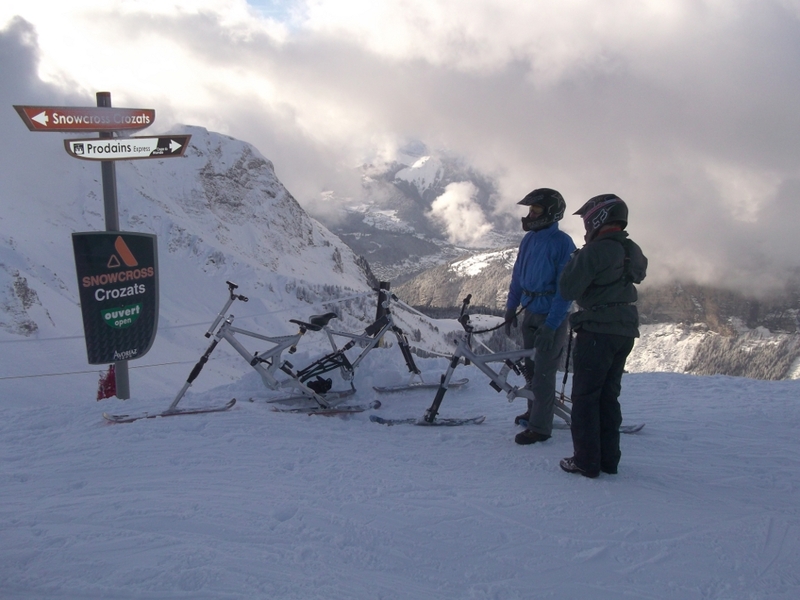 There isn't a package holiday provider that covers skibike holidays, yet! So you really need to network with the established skibikers and arrange independent travel. A couple of years ago I started a Facebook group, to facilitate arranging trips and meet ups during my riding season. It has blossomed recently and there are a number of group rides happening this year in both France and Austria. You will find it here it will only take a minute of your time to join and you can get access to information about forthcoming skibiking events before they hit this site.